Despite two charismatic co-leads, the would-be comedy “All Nighter,” written by Seth W. Owen and directed by Gavin Wiesen, disappoints with a deafening thud. Just about every attempt at comedy comes across as sitcom-like, played out, devoid of inspiration. 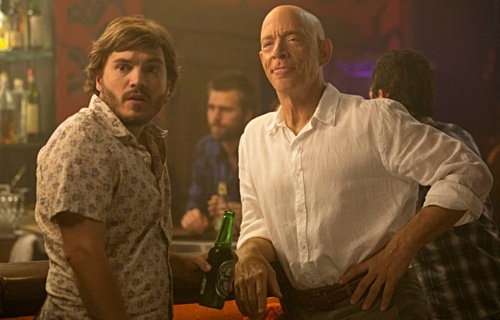 About halfway through, one cannot help but wonder what performers of J.K. Simmons and Emile Hirsch’s calibers saw in the script to sign up for a movie with barely anything going for it. The plot revolves around a missing woman named Ginnie (Analeigh Tipton), a character whom we barely get to know, let alone care about. Her father (Simmons), a workaholic who is often overseas, contacts her ex-boyfriend, the good-natured, banjo-playing underachiever Martin (Emile Hirsch), for possible information regarding her whereabouts. Mr. Gallo has gotten increasingly worried since it is so unlike Ginnie to not to pick up calls or return them on a timely manner. The title promises misadventures but the events that transpire are neither funny nor fun. The movie exists simply to pass the time. It is strange that the picture is at its strongest during the more dramatic scenes, its quieter moments of admission and confession. Whether it be at the dinner table on a mid-level fancy restaurant or in a car in the middle of the night, when the protagonists sit down and simply speak with and look at one another, we recognize the raw potential of the material. This is because Hirsch and Simmons know how to carry a scene. They are not afraid of introducing pauses and silence. They have the ability to extract every little emotion from the words their characters say and feel. These moments of gravitas are never earned, however. We get the feeling that characters are revealing something about themselves simply because the plot requires it in order to create a semblance of character history or development. Supporting characters are so extreme at times that they are almost cartoonish, caricatures. The couple constantly at each other’s throats (Taran Killam, Kristen Schaal), the barista who couldn’t be bothered (Stephanie Allynne), and the drunk party girl (Xosha Roquemore) quickly come to mind. Sure, eccentric people do live in Los Angeles but is it truly necessary to paint nearly every character encountered as one-dimensional freak show? A standout is a woman named Lois because she is actually normal. More importantly, however, she is played with winsome energy by Shannon Woodward. As soon as the picture was over, I had to look up her body of work because she knows how to get our attention without leaning on creating an exaggeration. I couldn’t believe I had never seen her before. “All Nighter” could have used several dosages of fun and authenticity. With a cast of recognizable names and faces, it is unfortunate that the material isn’t willing to take enough risks by trying on different types of comedy to attempt to find which works best for itself. What results, for the most part, is a forgettable and occasionally soporific romp.